Hydroponic gardening is simply growing without soil. 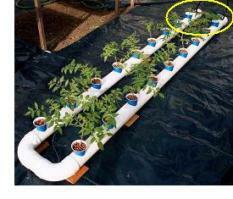 In this type of garden you provide all of the nutrients your plants need through the water in the hydroponic system. Plants require water, nutrients, and Oxygen at the root level, and different hydroponic systems will provide these three elements in various different ways. The key to success in an indoor garden is to know the requirements of your plants very well, and then to simply provide for them. This is especially true when it comes to the lighting requirements and feeding requirements of different plants. A crop of lettuce may do very well grown under fluorescent lights, whereas tomatoes and other vegetables require a much more intense light source to guarantee vigorous growth and healthy development. In addition to nutrient strength and light intensity, every plant has a pH that is preferred. It is also very common for the light requirements and/or nutritional requirements of your plants to change as they grow. For example, they may need a dark photo-period to get them to fruit, or they may require less Nitrogen and more Phosphorus and Potassium as they go from vegetative growth into flowering/fruiting. Having a feeding plan in advance, tailored to the needs of the plants you are growing, is extremely helpful to getting great results. Once you have a feeding plan, it's just a matter of maintaining your nutrient solution properly on a day to day basis...according to the feeding plan. Indoor organic and hydroponic gardening can be very rewarding, but the challenges of providing for plants indoors can be overwhelming to a beginner, and can be challenging to even an experienced gardener. I started gardening indoors over 20 years ago, and I quickly realized how much conflicting advice was out there, and how little useful advice there was for indoor gardening in general, and for hydroponic gardening in particular. After many years of persistent trial and error, I now enjoy helping garden lovers all over the world. I try my very best to make the information here easy to understand, yet very helpful (Easy RSS feeds to the left). Helping you do it right the first time! Explains the main types of hydroponics growing systems and how each hydroponics growing system works, Includes homemade section and feeding tips. Instructions and tips for building homemade hydroponics systems that work, and produce great results. The indoor garden grow lights page is a crash course of the basics to help do it right the first time. Covers garden grow light types, use and general tips and advice. Short garden designs page for indoor gardens is unbelievably easy and will leave you with the best design. Organic gardening indoors. helpful and simply written. Explains organic gardening from an indoor gardening point of view. Covers organic soil mixes, organic amendments, organic hydroponics, feeding tips, lighting tips, and more. Explains 4 stages of the plant life cycle and discusses human manipulation of plant life cycle behavior. Natural pest control keeps poison out of your food. Info for every indoor gardener, organic or hydroponics, learn how. There are several factors that affect plant growth. Looking at these factors is an excellent way to troubleshoot an indoor garden area, solve problems, and maximize plant growth. Just learning hydroponic gardening? Love gardening with organics? Get frequent updates, with the best plant feeding tips, plant growth information, and easy garden design tips.